Typically pan-fried and served alongside sheng jian bao, guō tiē (Chinese: 鍋貼) are a common Shanghai street food snack sold throughout the day. These Northern Chinese style dumplings are larger in size, with thicker, chewier skins and a juicy pork filling. They are typically sold in small bags of four for 3 kuai. The dough of the dumpling is made from water and flour. Though the fillings can range from vegetables to chicken or beef, the most common street food guo tie are filled with juicy ground pork. The minced pork filling is seasoned with salt, pepper, and minced chives. The Chinese method of preparing dough first pours boiling water onto the flour and allows it to stand for a few minutes before adding a small quantity of cold water. This allows for the gluten to activate in the dough. After the dough of the guo tie is made, smaller balls are individually formed to be rolled out into circles with thinner edges. The ground pork mixture is placed in the center of the dough and folded inside. Once the dumplings are prepared, a shallow, round pan is filled with a bit of water. 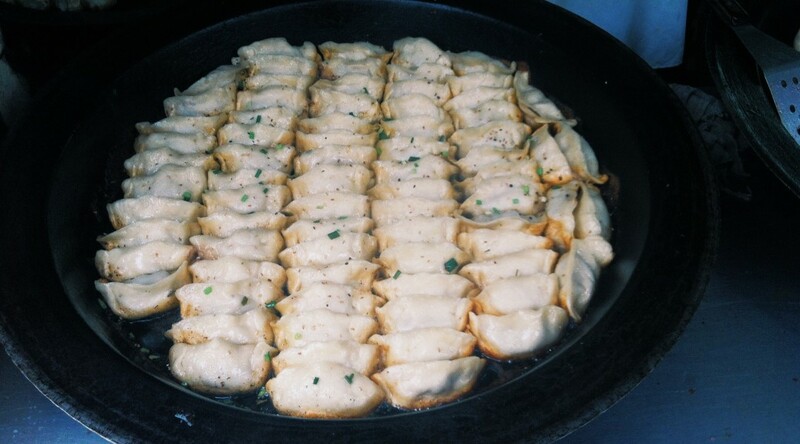 The dumplings are placed, fold-side up, into the pan usually alongside sheng jian baos. A wooden top is used to cover and steam the dumplings and buns before oil is added in order for one side of the skin to crisp up. The pan is given a shake in order to prevent the dough from sticking to the bottom and the pan is rotated a few times before being opened up again in order to be sprinkled with minced scallions. The dumplings are left in the pan for their bottoms to become a crisp, golden brown and their tops to be steamed and slightly chewy. The broader term for guotie is jiaozi, which means dumpling. Legends say that during the later years of the Eastern Han Period, one of the most well-known Chinese physicians, Zhang Zhongjing, invented a food to help peasants stay warm during the cold winter. He filled the dumpling with hot pepper and medicinal material as fillings.